Fermat’s Last Theorem Dr. S. Lawrence ©2005. 3 Or do we go even further back? Or, in words: the square on hypotenuse is equal to the sum of squares on two other sides. 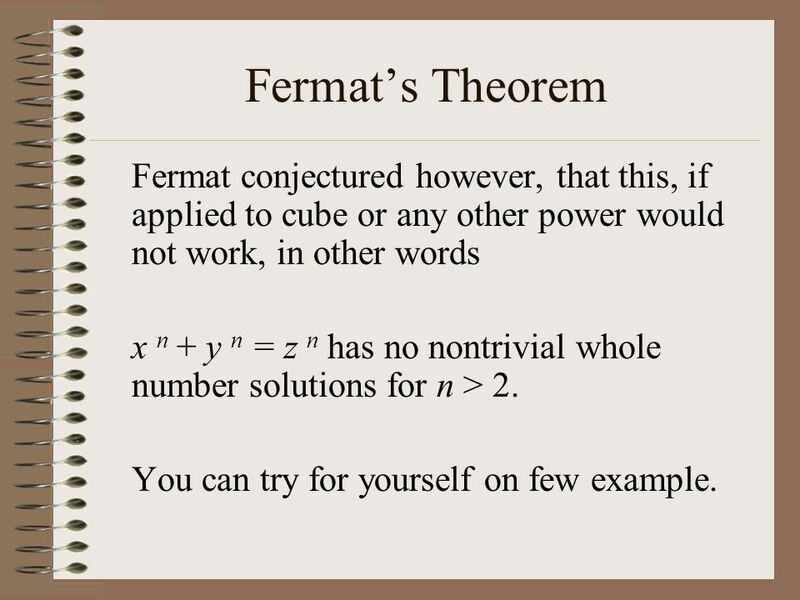 5 Fermat’s Theorem Fermat conjectured however, that this, if applied to cube or any other power would not work, in other words x n + y n = z n has no nontrivial whole number solutions for n > 2. You can try for yourself on few example. 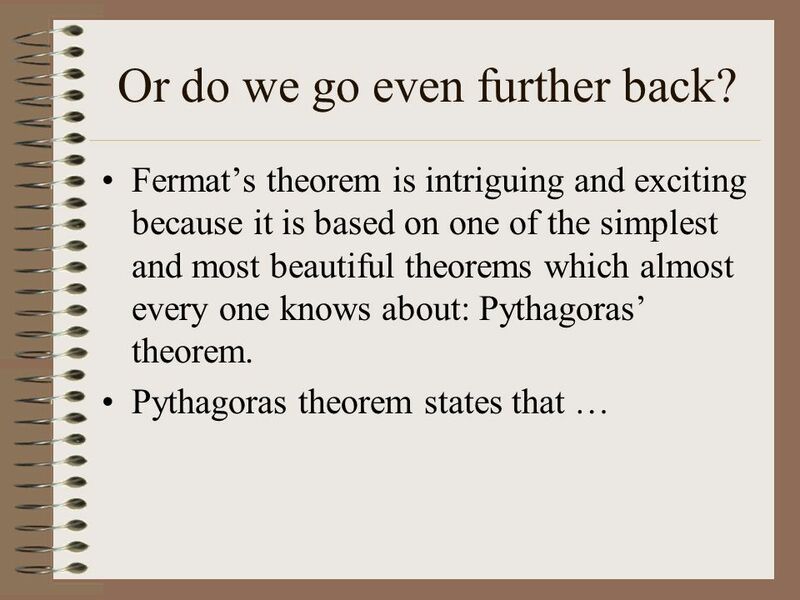 6 Why is it a theorem and not a conjecture? 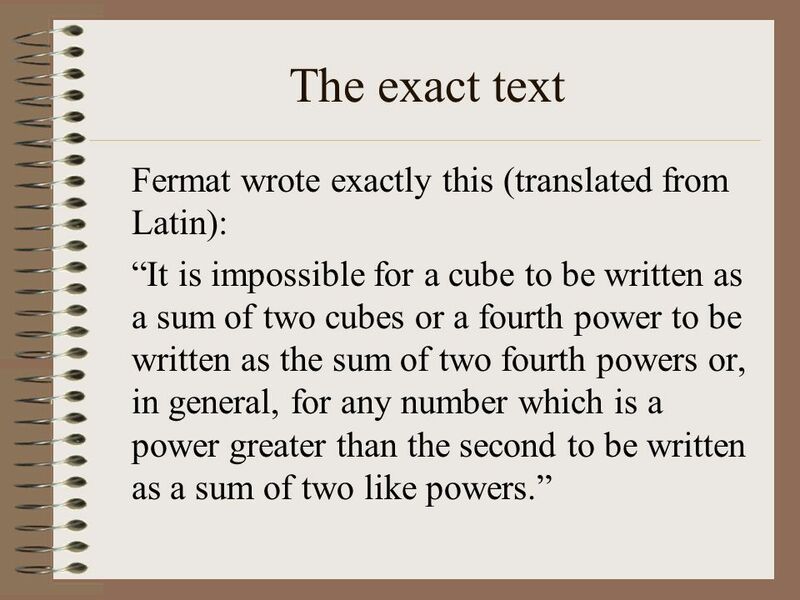 Had Fermat been satisfied to just write it down as we did on the previous page, it would have remained a conjecture. However, he wrote, in a margin of a book he was studying at the time (famous Arithmetica of Diophantus) that he just did not have enough space to write the simple proof, although he was in a possession of one. 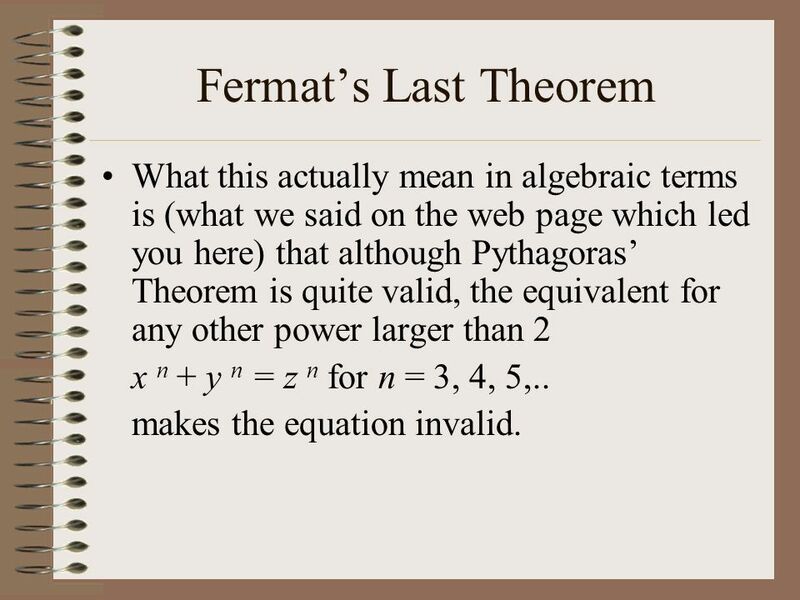 9 Fermat’s Last Theorem What this actually mean in algebraic terms is (what we said on the web page which led you here) that although Pythagoras’ Theorem is quite valid, the equivalent for any other power larger than 2 x n + y n = z n for n = 3, 4, 5,.. makes the equation invalid. 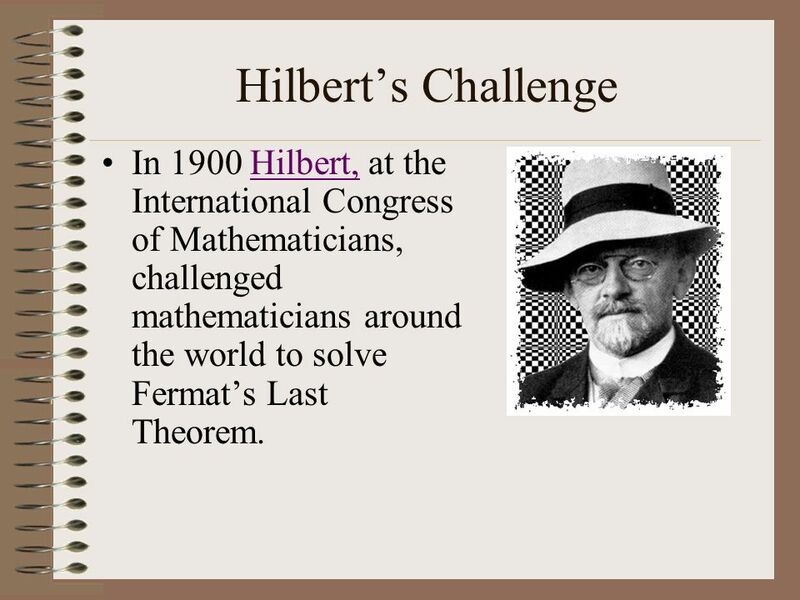 10 Hilbert’s Challenge In 1900 Hilbert, at the International Congress of Mathematicians, challenged mathematicians around the world to solve Fermat’s Last Theorem. 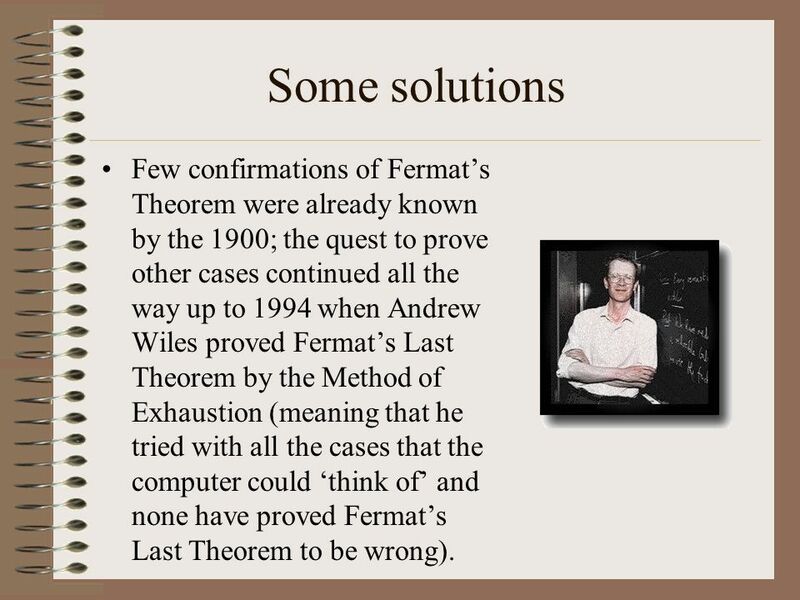 11 Some solutions Few confirmations of Fermat’s Theorem were already known by the 1900; the quest to prove other cases continued all the way up to 1994 when Andrew Wiles proved Fermat’s Last Theorem by the Method of Exhaustion (meaning that he tried with all the cases that the computer could ‘think of’ and none have proved Fermat’s Last Theorem to be wrong). 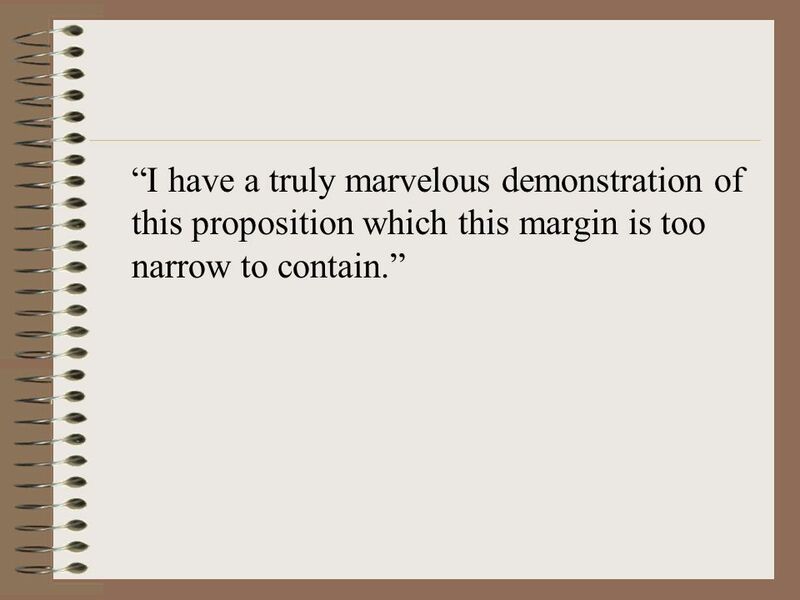 But you can still work on it… Think of a nicer or more ‘elegant’ proof to confirm (or disprove!) 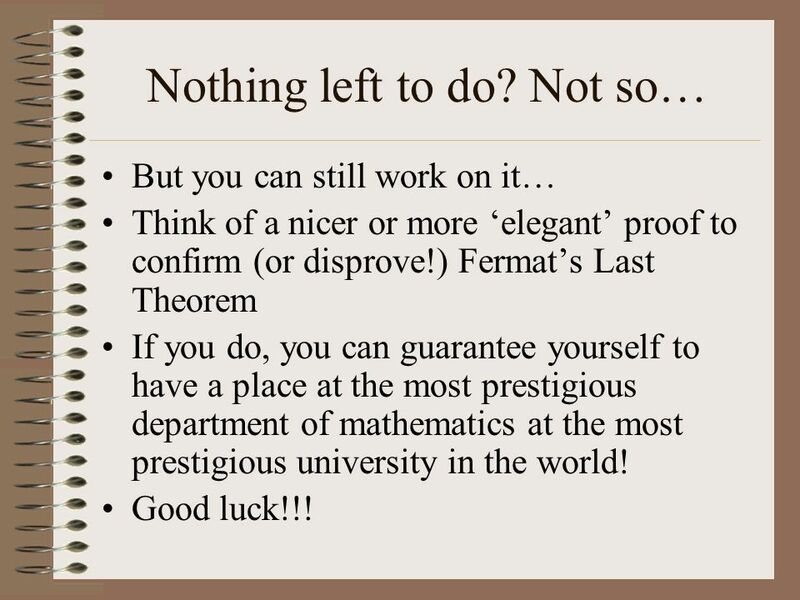 Fermat’s Last Theorem If you do, you can guarantee yourself to have a place at the most prestigious department of mathematics at the most prestigious university in the world! Good luck!!! 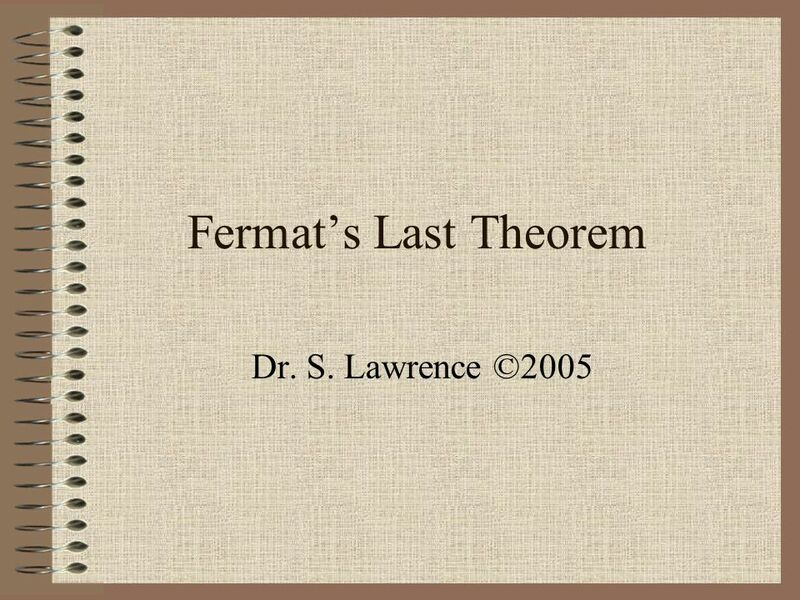 Download ppt "Fermat’s Last Theorem Dr. S. Lawrence ©2005." Fermat’s Last Theorem by Kelly Oakes. 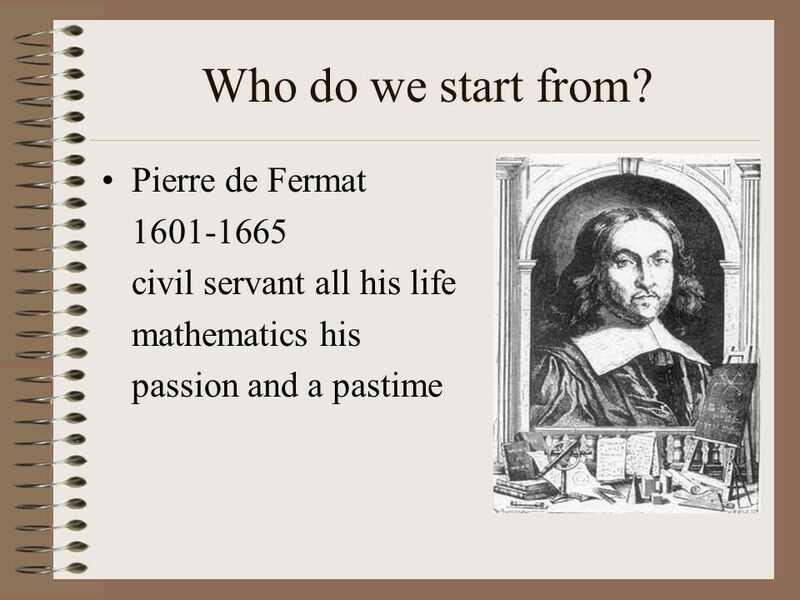 Pierre de Fermat (1601 – 1665) Born in Beaumont-de-Lomagne, 36 miles north- west of Toulouse, in France. He was. Prime Numbers A prime number is a number with exactly two factors The first ten prime numbers: 2, 3, 5, 7, 11, 13, 17, 19, 23, 29. 22C:19 Discrete Structures Logic and Proof Spring 2014 Sukumar Ghosh. More Number Theory Proofs Rosen 1.5, 3.1. Prove or Disprove If m and n are even integers, then mn is divisible by 4. The sum of two odd integers is odd. Pythagoras Pythagoras was a Greek scholar and philosopher in the late century BC. Known as “the father of numbers, his teachings covered a variety of areas. 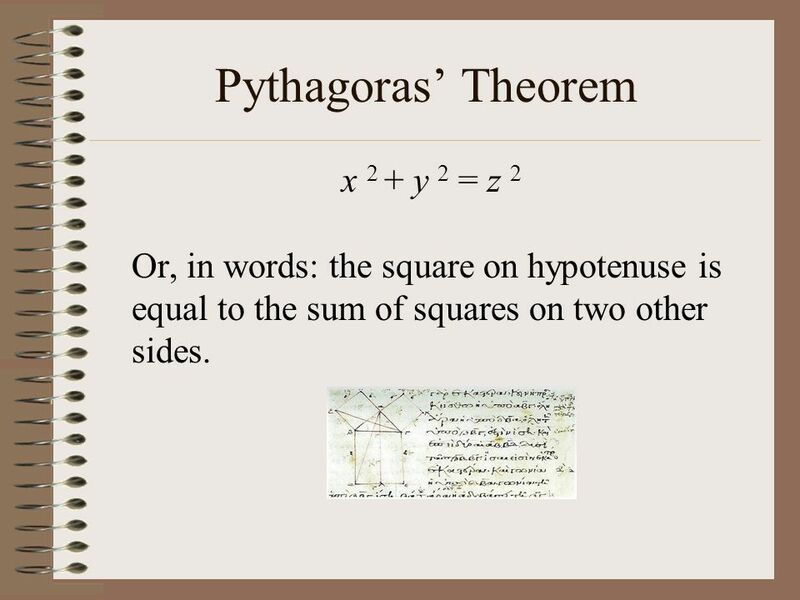 Pythagoras Pythagoras was a Greek scholar and philosopher ca 548 BC to 495 BC. Known as “the father of numbers, his teachings covered a variety of areas. 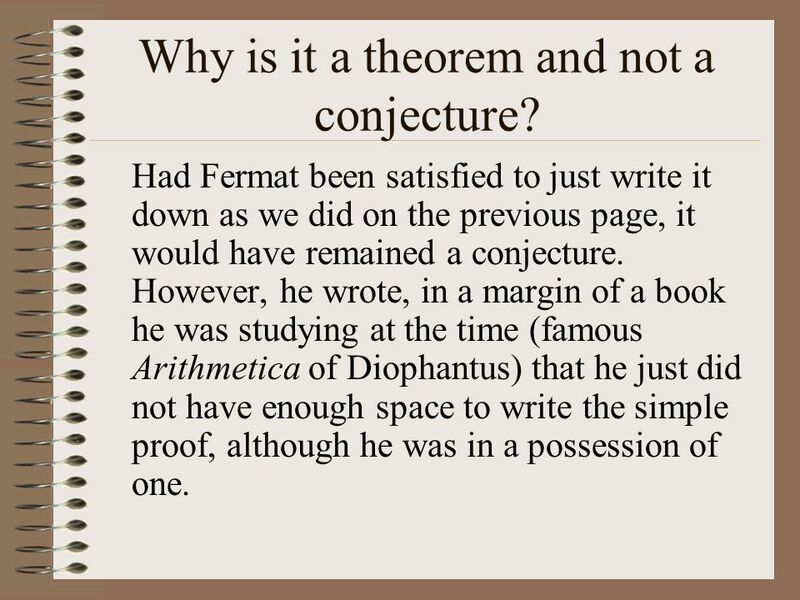 Number Theory: Fermat’s Last Theorem Fermat’s last conjecture/Wiles’ Theorem: For n>2 the equation x n +y n =z n has no solutions in terms of non-zero. Pythagoras Proofs TEKS 8.07 (C): The student is expected to use pictures or models to demonstrate the Pythagorean Theorem. Apply the Pythagorean Theorem Chapter 7.1. Sides of a Right Triangle Hypotenuse – the side of a right triangle opposite the right angle and the longest. Math 409/409G History of Mathematics Pythagorean Triples. Pythagoras’ Theorem PYTHAGOREAN TRIPLES. What are Pythagorean Triples?  Aka Pythagorean Triads  Are 3 whole numbers that satisfy Pythagoras’ Theorem. Proof of Pythagoras’s Theorem GCSE Higher. ‘Prove’ means what exactly? A proof in mathematics is a process of logical steps Each step makes a statement. Fermat’s Last Theorem: Journey to the Center of Mathematical Genius (and Excess) Rod Sanjabi. SECTION 5-3 Selected Topics from Number Theory Slide 5-3-1.